Last October, Luz Interruptus, the Spanish creative collective was invited by the University of Michigan Institute for the Humanities to set up one of its most famous installations - Literature vs Traffic - in Ann Arbor, after they had previously installed it in Toronto, Melbourne, Madrid, and New York. Six years after first making its way onto the scene, Literature vs Traffic the installation by the Spanish creative collective LuzInterruptus has unfortunately not lost any of its relevance even now. Still today, it is a dream to see literature take over the streets and conquer all the public places, offering passers-by a traffic-free area that, for a few hours at least, will surrender to the humble power of the written word. Despite the fact that we all know about the environmental and health impact of the uncontrolled use of cars, few of us are prepared to give up using them, often with the excuse of a poor public transport system. Invited by Amanda Krugliak, visual and performing artist and art curator who works at the University of Michigan Institute for the Humanities LuzInterruptus brought Literature vs Traffic to a street in Ann Arbor normally not friendly to pedestrians and for one night turned it into a place of peace, quiet and sharing, lit by the suffused light that shone from the pages of the books lying on the asphalt. About 10,000 books were used, collected in this case from the university, local bookshops and private citizens to be the key object of the installation but more importantly a gift and opportunity for new stimulation for the people who participated and took home the books they liked. In this sense, like all the other works by LuzInterruptus, Literature vs Traffic is an interactive, environmentally-friendly artwork because everything is recycled and nothing is left on the street. Obviously, the position selected was central: the corner of State Street and Liberty Street, the city's main artery, closed to traffic for 24 hours, but as the artists say, “the world didn't end”. 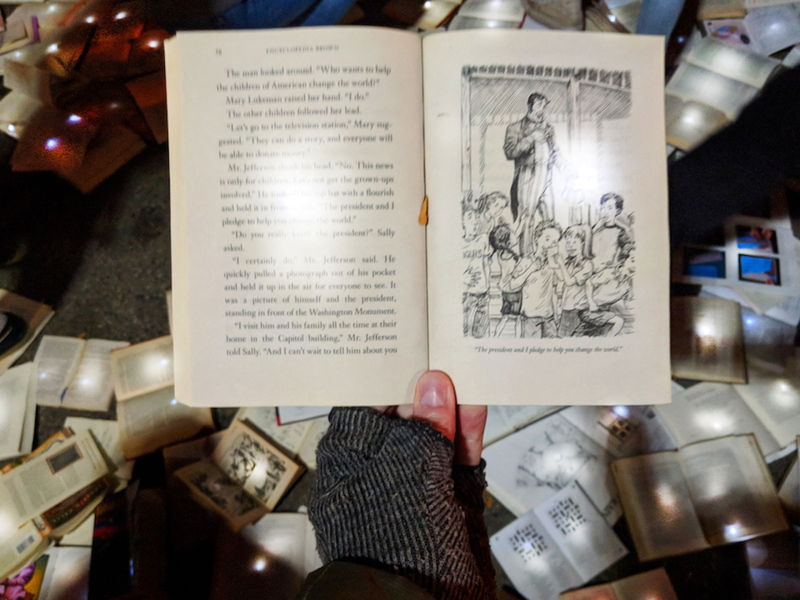 Then on 23 October, 11,000 lighted books on the street turned it, for a few hours, into a river of white waves formed by the book pages stirred by the wind and fixed in the eternal present of the web through the many, many photographs. At nightfall, visitors were invited to enter the installation itself and pick up the books, taking the ones that interested them the most. In less than two hours, all the lighted books had disappeared, taken away by all the enthusiastic people who filled the bars and restaurants with armfuls of books, a magical event in itself. At midnight, the street was completely clean and empty, proof of the huge success of Literature vs Traffic, which not surprisingly is one of the most beloved proposals of the many creations of LuzInterruptus, like the others filled with great beauty and poetry. Although the cars reclaimed their space, the people who walked by this place that night will hold the memory of how once books took over a street in their city and the result is an impressive stimulation: now they know that their city could be different.